save. If your job requires a suit and a tie daily, then we are happy to be your personal dry cleaners. This means that you can dump a few pieces at our place weekly and we will have you covered for the whole week when it comes to outfits. 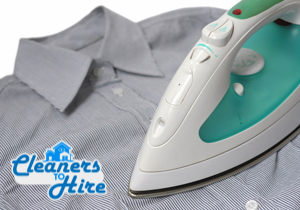 We possess strong steam irons which are not available for domestic use. With them our workers will get rid of all sorts of wrinkles regarding of the material out of which your shirt, coat or trousers are made of. You are guaranteed to have fresh clothes no matter where in London you are located. is disinfected. Cleaners to Hire has high quality dry cleaning technology and supplies. In case you have nasty stains on your white shirt and think of it as completely ruined, simply get in touch with us. Our staff will put the solutions that we have to good use and will rid you of all sorts of dirt. Ketchup, wine, grass marks and even blood are usually a nightmare to deal with but luckily we know exactly how to sanitise your clothes. With us you are not risking the integrity of your clothes at all. Even though we apply powerful detergents none of them are harmful to the fabric of your clothes. Our teams are also very careful and delicate and the brushes and other supplies which they use are absolutely top class. Of course we also have full insurance which covers you against all sorts of damages and guarantees you a refund in the unlikely event of an accident. 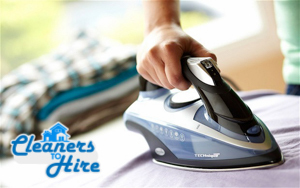 You have many options when it comes to booking us for ironing or dry cleaning in London. You can opt for the whole package which includes both services. You also decide how often you want us to wash your clothes. If you go with our weekly offer you can save some money but you can also gain loyal client privileges even if you come from time to time.